Vega specialised high gain antenna by Comarcom enables network planners to enhance and extend coverage, increase capacity of GSM, CDMA , 3G, 4G and LTE networks by increasing EIRP and diminishing spatial interference. The VEGA specialised high gain antenna is a very special coverage enhancement product. It is a unique, Very High Gain Antenna specially designed for cellular radio access networks. 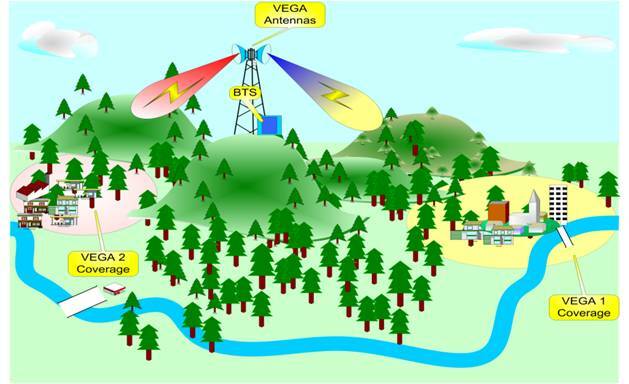 The VEGA does not compete with or replace common sector panel antennas but rather presents RAN network planners and optimizers with a new and unique tool specially designed for difficult cellular radio access networks scenarios. By using VEGA antennas in the cellular network, the operator can gain a significant savings of needed cellular towers, base stations and repeaters while providing the most efficient coverage with minimum CAPEX. VEGA antennas concentrate the signal of your base station or repeater (just like a spot light) into a powerful narrowly focused beam that provides good quality and reliable service where customers need it at distances up to 50% greater than common panel antennas. These specially designed narrow beam directional cellular antennas provide extremely high gain over standard sector antennas, exceptionally narrow beam width with very low side and back lobes and ±45° dual polarization diversity. Our customers Vodafone NZ and 2 Degrees mobile have used VEGA Specialised High Gain Antennas to address locations with specialised or difficult radio access scenarios to provide quality mobile service to their customers.